Perhaps the most pleasant and memorable moments in the life of someone about to enter into holy matrimony. the time when the longing to spend every moment with your loved one is the strongest emotion that you feel. that phase of courtship when it is certain that the one you love will be yours soon – forever! Yes, what is being referred to is the ‘engagement’ – a sweet and short affair, usually a private one, to make matters official and to announce the countdown to the ‘big day.’ The most important event that is carried out on this day is the exchange of rings, which serves the purpose of binding the couple together as they proceed to the next phase of their lives. Understandably, the engagement ring is a special one and couples take great care while selecting the ring that will mark the beginning of a beautiful relationship. In simple terms, it must be as beautiful as they would want the relation to be! While traditions and current trends must be kept in mind while looking for the perfect ring for you and your loved one, you must take care not to let this stand in the way of your personal preferences and tastes. This is essential because on your big day you need to feel good about everything, including this most crucial element namely the engagement ring, more than anything else. The best bet therefore would be to try and strike the right balance between tradition and contemporary trends so as to not make your precious engagement ring look like it belongs to a different era altogether! Take time to ponder over what you and your would partner genuinely value in your engagement ring. Is it going with what is ‘hot’ in the marketplace? Or is it a touch of antique designs with a contemporary twist? Is it more utilitarian – where features that facilitate easy daily wear outweigh stylish embellishments and design? Or is it totally outlandish – all of a head turner? Identifying this aspect will make it easier for you to zero in on the right choice for you. Design trends in engagement ring styles and settings are ever-changing, reflecting today’s busy lifestyle. One of the most noticeable trends is that ergonomic designs have come to reign supreme of late; a sleek design with an unobtrusively set stone that will interfere the least with what you do is a good idea for those of you who are looking at wearing your engagement ring day in and day out. One important consideration to make is that this is a ring that you will wear for a long time to come. It therefore would be wise to go for classic designs that never go out of vogue. An example of this is the brilliant cut, solitaire diamond engagement ring sporting a round diamond. Cut: Diamond cuts that display more facets are gaining popularity; cuts like Asscher, cushion and princess cut diamonds as well as the traditional oval and pear shaped diamonds are back in demand of late. The general trend is moving away from classic cuts. Setting: Sleek, innovative and modern settings like bezel, tension and hammer set stones are rising in popularity since these match evolving lifestyles. The prong, champagne and halo settings are also among the most popular, as is the pavi and micro pavi settings involving multiple stones. The general trend again, is moving away from classic settings. Metal: Platinum stands for purity, elegance and durability, and is the new favorite when it comes to making trendy engagement rings; its silver-white rich luster beautifully enhances the brilliance of diamonds. Although yellow gold continues to be the classic choice, two-tone engagement rings make a style statement, and rose gold helps enhance the appearance of antique styled rings. Color: Colored diamonds are also gaining popularity – canary yellow, pink and blue diamonds, black diamond jewelry are the hot favorites of late. Brown diamonds are also making a come-back of sorts now. The evergreen rule of ‘the bigger, the better’ seems to hold good for engagement rings. 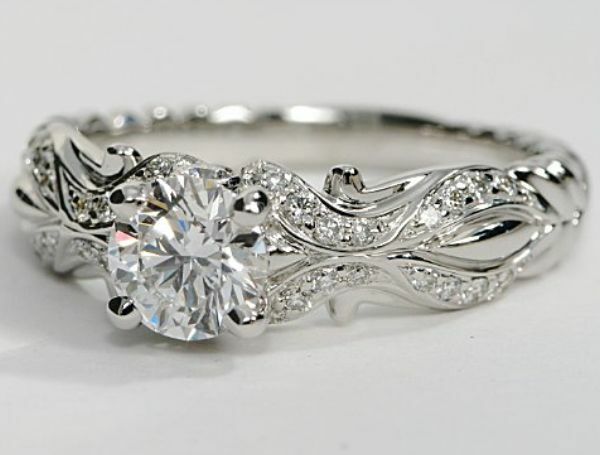 Another fast emerging trend is that of having a modern take on antique style rings. The versatility that modern jewellery-making methods provide makes it possible for vintage designs to be reproduced with the same fine attention-to-detail that is evident in most antique rings. Filigree settings and flower motifs are popular designs in this category. Matching engagement and wedding ring sets are also in great demand at many leading jewelers’. Exquisite ranges of matching platinum ring sets featuring a variety of styles and cuts are available that you can choose from. 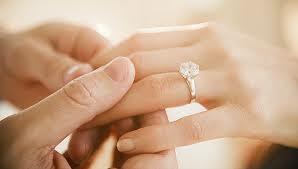 All you need to do is to ensure that you have a jeweler of repute to buy your engagement ring from. Wish you a happy engagement!